When Bryan Fogel decided to investigate doping in sports, he had no idea where his journey would lead. An amateur bike racer, Fogel’s initial plan was to dope himself, observe the changes in his performance, and see if he could evade detection. In order to achieve this goal, Fogel enlisted the help of renegade Russian scientist, Dr. Grigory Rodchenkov, a senior figure in his country's "anti-doping" programme. Over dozens of Skype calls, urine samples, and self-administered hormone injections, Fogel and Rodchenkov grew closer - despite shocking allegations that place Rodchenkov at the center of Russia's state-sponsored Olympic doping programme. I’ve had few moments of sporting glory in my life. As a result, I respect and admire all those men and women who have the commitment and innate talent to achieve success in any sport. However, after watching Bryan Fogel’s documentary, I wonder if I will look at these achievements in the same way ever again. For, as Icarus explores, why would we watch sport if there is a desperately uneven playing field - if we know that some competitors are taking performance enhancing drugs (PEDs)? Icarus is a documentary in two parts. The first follows Fogel’s struggle with the prevalence of doping in sport. A committed cycler, he was shocked and bitterly disappointed by the PED scandal involving his hero, Lance Armstrong. This revelation (and others like it) makes Fogel question his own cycling performance. Why has he never made it to the top of the cycling pack? Would PEDs make the crucial difference? Fogel’s decision to use himself as a PED guinea pig makes for fascinating and uneasy viewing. In visually stunning scenes, we watch as his performance improves. However, as he injects himself with testosterone, we cannot help but wonder - is this experiment worth the potential cost? Then, of course, there is the small issue of evading detection. Here, with the arrival of Dr Grigory Rodchenkov (a complex and fascinating character), Icarus changes gear and becomes a shocking expose of statewide doping in Russia. Of course, many news reports over recent years have examined the disturbing situation regarding the use of PEDs in Russia. It is nonetheless shocking to hear Rodchenkov explain just how endemic this process was (and is?) and how far up the chain of command the conspiracy goes (no medals for guessing this answer). While I felt more uncertain, Fogel wholeheartedly supports Rodchenkov in Icarus. It is easy to see why - the scientist is extremely charismatic and has a incredible story - a story that could cost him his life. Despite the danger, Rodchenkov is convinced that the truth needs to be told. However, what will change once the truth is out? Are those in power brave enough to tackle the issue of PEDS? The conclusions are just as shocking as the revelations themselves. 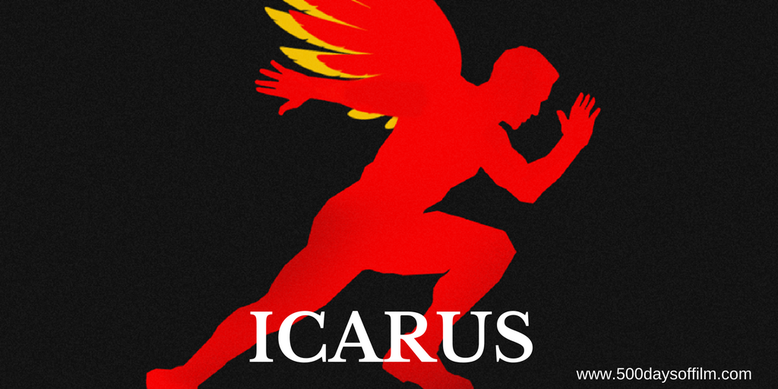 With a running time of over two hours, Icarus does feel its length and sometimes struggles with its narrative shift. However, these are small issues within this fascinating and powerful documentary - a truly remarkable filmmaking achievement. If you have, what did you think of Byran Fogel’s film? Let me know in the comments section below or let’s discuss this documentary over on Facebook or Twitter (@500DaysofFilm).